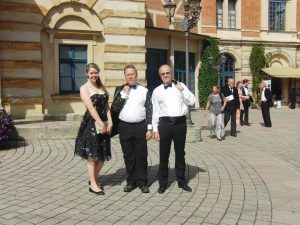 Saturday – off to Bayreuth for the Wagner with Rollo, JR and daughter Catherine. I am an excited kid. An early flight. Clearly Rollo and I are different. Before bedtime last night, I tell him we need to be on the road to Gatwick at 4am. Because of the hour, we will sneak out quietly. To me that would mean getting up at 3.45, quick wash and brushing of teeth and into the car, all further ablutions to be conducted en route. Not so Rollo. His alarm clock rings at 3am – an alarm that would have comfortably alerted shipping. Rollo fills the bathroom basin with water and the house with his own unique rendition of the major arias from Tannhauser. Never has the phrase ‘special rendition’ been more apt. Inevitably, we arrive at the airport in plenty of time. Rollo is already fretting about breakfast and the availability of food at the departure gates. Normally I’m the one, Mr Shakyshuffles, who attracts the interest of the airport security but not today. Today, for whatever reason, it is Rollo who is to be frisked, swabbed and X-rayed. He emerges from their clutches having narrowly avoided the Marigolds. The security guards are also surprised to be asked about breakfast. We settle for a bacon roll and an espresso each. Rollo perks up. Two hours later we are in Munich. When JR’s flight from Malta arrives an hour or so later, Rollo is already beginning to make noises about lunch so the three of us settle for bratwurst and sauerkraut at the sports bar. Even after six bratwurst apiece, it seems churlish to resist strudel. Rollo is eying up the Sachertorte. We pick up the car keys from Europcar and directions to its location in the car park. The teutonic veneer of calm and efficiency is cracked a moment later when a flustered Europcar assistant appears. ‘You vait please. Ze car ees on fire’. Ve vait. Still we wait. Four fire engines and an ambulance appear. They seal off the car park in a blitzkrieg operation and set about dowsing all the top-of-the-range Mercedes they can find. No reason – they just enjoy their job. After half an hour of this cabaret, the car park is reopened. We find the car and it becomes obvious that the rental assistant had confused the definite and indefinite articles in her message. Our car is not even smouldering. Two hours later, the familiar shape of the Festspielhaus, standing proud on the grunen hugel looms into view. We are in Bayreuth, having safely negotiated the A9 which, on the evidence of some of the driving we saw, is clearly an extension of the Nurburgring. It is thirty one degrees, eighty eight in old money. Not a cloud in the sky. The hotel does not have air conditioning. In former times, Rollo, JR and I would have automatically headed for the first bar and drunk dunkelbier until our heads hurt. When you are young, this seems almost mandatory. But with a cumulative age pushing a hundred and sixty, we are a little more circumspect. A siesta, a shower and a shave takes an hour or two and, when we meet in the lobby, our thoughts are leaning more toward an early supper and early night rather than life-endangering volumes of Bavarian pilsner. Life’s clock runs slower. We settle on Oskar’s halfway down Maximilianstrasse for a ‘light snack’. This phrase, of course, has no meaning in Bavaria and we are soon faced with mountains of food. 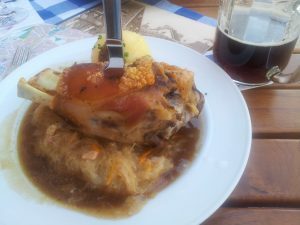 My pork hock is the size of a rugby ball while Rollo’s schnitzel is nearly A4. Both go down well with a couple of ‘dunkels’. Nonetheless, it is clear that a diet consisting solely of pig pieces, dumplings and beer will be a belt-busting course of action, even if only for three days. I point this out at breakfast. More dietary balance is needed. Rollo nods, pours himself a small glass of orangensaft and returns to the table with a ‘there, that will do it’ sort of look. He has a sixty page synopsis of Lohengrin in front of him and is in no mood to let a coronary get between him and his Wagner. 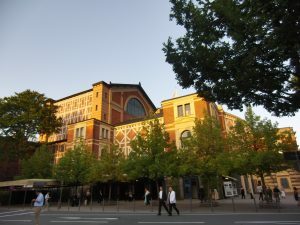 It’s Sunday and tonight’s treat at the Festspielhaus is Lohengrin, a four hour mediaeval swords-and-sorcery bash featuring, in the blue corner, Miss Goody Two Shoes, Elsa von Brabant. Pitched against her, in the red corner, and demonstrating conclusively that Wagner’s baddies are always his most interesting characters, is the scheming witch Ortrud. It’s a heavyweight bout. Two Wagnerian sopranos on one stage! Something has to give. The plot consists mainly of swans, magic, sword fights, and lots of animated accusations. Into the middle of all this hocus pocus comes Lohengrin, a knight of the Holy Grail, who marries Elsa on the condition that she never asks his true name. My first reaction is that this will make signing the register difficult at the very least but nobody, least of all Wagner, seems to have thought of this. Still, Lohengrin won’t be the first husband in history to learn to respond to “Oy, you”. In any case it’s an excuse for a knees-up. Inevitably, within an hour of exchanging vows, Elsa blots her copy book and asks his name “It’s Wayne, isn’t it? Or Darren”. Lohengrin soon tires of playing Twenty Questions and calls a press conference to announce his name to anyone who cares. Ortrud and the baddies, who have money on “Elvis” at eighty five to one, turn up too. Predictably it all kicks off and, by the end, the key players in the drama are, for the most part, dead. Lohengrin, without a hint of social responsibility, waltzes off in a swan boat, leaving much blubbing among the girlies and an astronomical bar bill. Great music but, with the best will in the world, a pretty wonky plot. This already flaky plot is rendered even more bizarre by a staging in which most of the characters are wearing laboratory rat costumes. No, really. There is, needless to say, no precedent for this in the opera. Nevertheless, as neither Rollo, JR nor I have seen Lohengrin before, we are looking forward to it hugely. Rats or no rats. But before we get there, we have to fetch Catherine, the last of our party. Claire has generously surrendered her Bayreuth ticket to our musician daughter who, in any case, has been studying Wagner at college. The logistics are complex – Catherine has been playing a concerto on the Saturday and therefore could not travel with Rollo and I. She has been spared Rollo’s early morning Tannhauser medley and is on the redeye from Gatwick to Munich on Sunday. To cut a long story short, JR and I drive to Nuremburg to collect her at lunchtime on Sunday. Clear roads mean we are early. We stop for half an hour at the infamous Zeppelin field. Even decayed, the stadium has an uncomfortable presence. The terraces have gradually become banks of wild flowers while the concrete of the dais and colonnades slowly crumble, permitted only such maintenance as to make the structures safe. Although now mainly used by enthusiastic youths with skateboards and roller blades, and visited by a handful of tourists, there was a time when this place echoed to different voices with darker passions and beliefs. Catherine is waiting for us in designer sunglasses, bassoon on her back, and cooling herself with a strawberry fan. The temperature is now an egg frying thirty nine degrees Celsius or a hundred and two degrees fahrenheit. By the time we reach the Festspielhaus, in our glad rags and ready for action, this has fallen to a mere ninety nine degrees Fahrenheit. 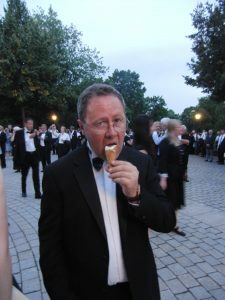 A temperature barely worth a mention except for the fact that we are all in dinner jackets, our seats are in the balcony and the Festspielhaus has no air conditioning. We may look like penguins but we do not feel like them. This is going to be tough. By the end of the first act, I know just how tough it is going to be. My meds have the side effect of lowering my blood pressure and making the blood pool in my ankles. A minor irritation most of the time but a bigger problem if you throw in vasodilation, low blood sugar levels and a little dehydration. Add an inability to move – due to the opera not the Parkinson’s – and things can turn nasty. After an hour, I know I am in trouble. My shirt is drenched, sweat is pouring into my eyes, and I can feel the tell tale signs of fainting as my peripheral vision closes in and my ears ring. Somehow I make it to the end of the Act. Rollo and JR are concerned enough to fetch lemon sorbet. But I clearly won’t make it to the end of the opera. There is also the small matter of the tickets. At £150, you do not surrender the things lightly. I phone Catherine, who was sitting out Lohengrin, to put on her frock and some lippy and hotfoot it to the Festspielhaus. The third act is hers. I will find a cool shady place nearby and rehydrate. This proves prudent. Bayreuth frequently claims victims. It’s understandable – the audience is pretty old and the temperature in the theatre is oppressive. So sitting out the third act is common sense not common cowardice. Catherine gets her first experience of Wagner and I live to fight another day. Which is more than can be said for the poor fellow I see stretchered out shortly after the bridal chorus. A blue flash dash. Go direct to Valhalla. Do not pass Go. Last night’s ill health during Lohengrin has left me with some serious thinking to do. I am anxious to avoid a repeat performance. Good friends that they are, Rollo and JR are also determined to avoid any further problems for me during tonight’s offering on the green hill. Especially since it will be just as warm today. Rollo, who is sitting out tonight, will be our support team. His allotted task is to make sure we – Catherine, JR and myself – keep ourselves in as good a shape as possible during tonight’s opera. Never has this support been more essential than during tonight’s performance. Because the opera in question is Tristan und Isolde, one of Wagner’s longest meisterwerks and one of my particular favourites. To cut a long story short, the opera opens with Tristan ferrying Isolde to Cornwall to marry his boss King Mark, having already killed Isolde’s boyfriend before the curtain has even risen. Needless to say, Tristan is not on Isolde’s Christmas card list. And she doesn’t fancy being Queen of Cornwall. She is, it has to be said, pretty high maintenance in mediaeval terms. Still cross over that little boyfriend-killing episode, she decides to murder Tristan and herself with a poison drink, der Totentrank. All well and good. But her maid, the well-intentioned but rather soft in the head Brangaene, substitutes a love potion, der Liebestrank. Tristan and Isolde fall madly in love with each other, a state of affairs that is at best highly inconvenient, bearing in mind their domestic and employment circumstances. Oops says Brangaene. My bad. From here, things pretty much run the expected course. Four hours of opera later, Tristan and Isolde are dead – which they would have been anyway if Brangaene had not swapped the potions. The opera would have been three hours shorter though. Would Tristan and Isolde have fallen in love without being drugged by the love potion? Who knows. Who cares. Whether due to love or other drugs, the result is an excuse for some of the most sumptuous music Wagner ever wrote, especially so in the second act, an introspective bubble of self-absorbed passion containing, in my humble opinion, the most beautiful love duet in musical history. I’m babbling. I like Wagner. You know that. But my immediate problem is less the psychological tensions of the plot than the need to get through nearly five hours of Wagner in a sweltering opera house without (a) falling asleep, (b) passing out or (c) desperately needing the toilet. In the light of the Lohengrin, experience, you could probably add “(d) dying” to the list of possible negative outcomes. We need something that will sustain blood sugar levels and be reasonably invigorating. After much deliberation, we conclude that this will best be achieved by a combination of Red Bull and Jaffa cakes, taken before the opera and repeated during each interval. Rollo is on hand to administer to us. By the end of the opera, I have consumed three cans of Red Bull and eleven Jaffa cakes. This prescription proves astonishingly effective. My innate propensity for operatic somnolence is completely suppressed. I sail through the opera without problems. I am not only awake throughout each act, but alert and attentive. The strategy is a triumph. I feel great. The following day however, the strategy looks a mite less brilliant. We are leaving Bayreuth for France and, by the time we arrive at the airport, I have been awake for thirty four hours and counting. All well and good if I had been going to an all-night rave but, by any standard of uninterrupted wakefulness a high price to pay for yesterday’s triumph. Frankly, I look like death. So much for Red Bull. I’ll make it a Totentrank next time.